This technical note will provide step-by-step instructions on how to find what documents have been in a previous production in the eDiscovery Platform. This feature can help you find out if documents have been part of previous productions. For example, your case has different Bates prefixes for associated productions with independence of Bates ranges or Bates were uploaded with an Excel upload spreadsheet. Bates stamping can also come in with an incoming load file, as part of a production sent to you by the opposing counsel. 1-Showing the field 'Bates' in Browse or Search pages. That field indicates the current bates range applied to the documents. As a result, the main table will now only show the documents produced at specific bates range. 2- Production Job. 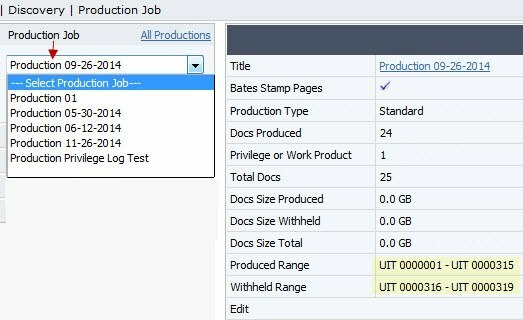 Also, if you run multiple productions the Bates Number for any document is stored within the Production Job page, so you can access the set of documents and download it multiple times. 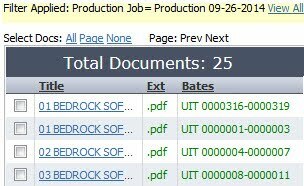 If you don't delete productions, the page will retain the bates number each document had when the production was first created. it redirects you to the Browse page automatically filtering on set of documents you added to the selected production. 3. Document Viewer (one document at a time). The Disc tab has a section called 'Document Id', that shows you the current Bates applied to the document you have opened in the Document Viewer page. Please note that the Bates shown on the Browse, Search and Document Viewer pages reflect the Bates Number the document was assigned in the last production. We also offer Project Management and Technical Services if engaged to support your productions efforts by helping to execute specific requests for bates stamping projects. Please contact Customer Support if needed.